It has been ten years since Brad Manera presented the Transcript below. Presented by Brad Manera, Military Historian, Australian War Memorial, on Friday, 12 September 2003 in the Hall of Valour at the Memorial. "Sixty years ago this week, Lieutenant General E. "Ned" Herring's I Australian Corps was fighting its way to the port town and nearby airfields of Lae in the Huon Gulf, New Guinea. In September 1943 the town and surrounding area was defended by Vice Admiral Fujita Ruitaro's Naval 7th Base Unit and Lieutenant General Nakano Hidemitsu's 51st Division. On the coast to the east of Lae, Major General George "Guts" Wootten's 9th Australian Division had landed and was advancing along the beach. To the west, Major General "Bloody George" Vasey's 7th Australian Division had been flown into Nadzab, after the capture of the airfield by US paratroops and Australian gunners, and was driving the Japanese down the Markham River valley toward Lae and the sea. One of Vasey's lead battalions were Lieutenant Colonel R. H. Marson's Queenslanders of the 2/25th. By 10 am on 13 September the battalion had been fighting through heavy jungle over the ridges beside the Markham Valley for four days and Japanese resistance was getting stronger. As they picked their way down the hill toward the overgrown Heath's Plantation, the Japanese were close, contacts frequent, and casualties growing. Captain G. A. T. Gow's B Company, in the lead, was suddenly confronted by entrenched enemy positions. The two forward platoons went to ground and were pinned down by intense enemy rifle and machine-gun fire. With the battle rapidly intensifying, Lieutenant R. T. C. Burns's platoon from B Company, found that it had five of its men dead and three wounded. The rest made themselves as flat as they could behind the dense but flimsy cover and returned the withering fire. Section commander Corporal W. H. "Billy" Richards was one of those wounded. He had multiple wounds in the arm, back, and stomach, and lay forward of the Australian positions, bleeding profusely. Despite his pain and exposed position, he shouted instructions to his men, directing their fire on the Japanese he could see. With scant cover from a tree stump, Richards would not last long. Uphill from Richards's stump, Privates J. H. Bickle and Richard Kelliher sheltered in a shallow dip. With the comment, "I'd better go and bring him in", Kelliher took Bickle's last hand grenade and charged down the hill at the machine-gun position that was their greatest threat. His grenades did not kill all of the crew, so he returned to his platoon mates, borrowed a Bren gun, and renewed his attack. After a return trip under fire to get another magazine, Kelliher knocked out the machine-gun position; then, still under enemy fire, he carried Richards to safety. Kelliher assisted in the rescue of two other wounded diggers that day. One Japanese officer and eight other ranks were later found dead in the weapon pit he had attacked. Kelliher was awarded the Victoria Cross for his valour. Corporal Richards recovered and was decorated with the Military Medal for bravery in the field. It took another two and a half days of savage fighting before the Japanese abandoned Lae and began their horror trek over the ranges. But what of Private Richard Kelliher, VC? He makes an unlikely ANZAC hero. He was an Irish migrant who suffered very poor health, had an uncertain employment record in civilian life, and had been charged with cowardice during the fighting around Gona in Papua in November 1942! Richard Kelliher was born on 1 September 1910 at Ballybranagh, Tralee, County Kerry, Ireland. While still in his teens, he migrated to Queensland with his sister Norah. They left five other brothers and a sister with their mother and ailing father in County Kerry. The Great Depression hit shortly after the brother and sister arrived in Australia. Initially inseparable, they were forced them to follow different paths by the hard times they encountered. Norah married and moved to Sydney. Richard left Brisbane, where he had served as a sacristan at St Stephen's Cathedral, and tramped the outback, finding work as a farmhand, cane cutter, house painter, and share farmer. The hard times and harsh conditions took their toll. Kelliher contracted typhoid and meningitis. For Kelliher, as for many Australians, the war came as welcome relief from the Depression. 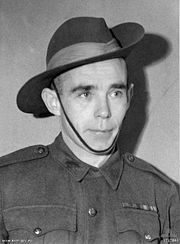 Kelliher enlisted in the Second AIF on 21 February 1941. He was posted to 2/25th Battalion as a reinforcement for the men they had lost in the Syrian campaign. He arrived in the Middle East too late to take part in the fighting against the Vichy French. The 7th Division returned to Australia in 1942, and was rushed to Papua to help stop the Japanese advancing down the Kokoda Trail toward Port Moresby. The battalion went into action in the second week of September 1942 and by November had helped drive the Japanese back across the Owen Stanley Range to Gona. In just over three months of fighting, the 2/25th suffered almost 60 per cent casualties. It was during one of the costly attacks on the Japanese beachhead base that Private Kelliher left his section as it advanced to attack the enemy. A rumour circulated that he had run away. He claimed that he had been sent back for information, but his platoon commander was killed and so could not be called in his defence. Kelliher fell ill with a bout of malaria and was repatriated to Australia. He rejoined the battalion in Queensland , and it was then that accusations surfaced about his earlier conduct: he was accused of "failing to get into his allotted position with his section and allegedly saying, 'its too bloody hot for me I am not a bloody fool'". Kelliher suffered a District Court Martial. He was charged with misbehaving before the enemy in such a manner as to show cowardice. The evidence against him was based on hearsay, and the finding against him was quashed a few months later. A year after it had gone into action on the Kokoda Trail, the 2/25th Battalion was again in action. This time, on 9 September 1943, they few into Nadzab, New Guinea, and within four days Kelliher performed the act that would earn him the empire's highest award from military valour, the Victoria Cross. In an interview for the Melbourne Sun newspaper in January 1944, Kelliher reflected on the impact of the earlier accusation of cowardice. He told the reporter: "I was soon reinstated in my battalion's regard but ever since I wanted to prove that I did not lack courage." After Lae, Kelliher's health broke down again. He spent months in hospital and rejoined the battalion in time to return with it to Australia. In hospital in New Guinea, he learned that he had been awarded the VC. In 1944 he was medically downgraded, no longer regarded as fit enough to serve in the infantry. He finished the war serving in a workshop. After the war Kelliher found himself little better off than he had been during the Depression. His medal earned him three trips to the United Kingdom. Kelliher's first visit was in 1946 with the Australian Victory Contingent to parade through London; the second was to attend the coronation of Queen Elizabeth II, in 1953; and his last, in 1956, was to participate in the celebrations to mark the centenary of the award. Despite his fame a reasonable pay packet remained elusive. Kelliher tried but failed to obtain a taxi driver's licence while working as a cleaner at City Hall, Brisbane. In 1949 he married 19-year old Olive Margaret Hearn. The family moved to Melbourne, and Richard eventually found work as a gardener. Over the next six years Richard and Olive had three children. The illness he had suffered before and during the war recurred frequently, and he was constantly in the care of repatriation hospitals. By the late 1950s Kelliher was considered totally and permanently incapacitated. On 16 January 1963 he suffered a stroke. Twelve days later, at the age of 52, he died in Heidelberg Repatriation Hospital. He was buried with full military honours at Springvale Cemetery, with two First World War Australian VC winners in attendance. In 1965 Olive Kelliher remarried. With her children at school and bills to pay she offered her late husband's medals for sale. There was a public outcry, and they were withdrawn. Veterans of Kelliher's old battalion, the 2/25th, raised money and purchased the medals. On 13 September 1966, 23 years to the day after he earned them, Private Richard Kelliher's Victoria Cross and service medals were presented to the Australian War Memorial by the 2/25th Battalion Association. They have been on display in the Memorial's Hall of Valour ever since. Discussion in 'War Against Japan' started by Blackblue, Sep 11, 2005. Sixty years ago this week, Lieutenant General E. “Ned” Herring’s I Australian Corps was fighting its way to the port town and nearby airfields of Lae in the Huon Gulf, New Guinea. In September 1943 the town and surrounding area was defended by Vice Admiral Fujita Ruitaro’s Naval 7th Base Unit and Lieutenant General Nakano Hidemitsu’s 51st Division. On the coast to the east of Lae, Major General George “Guts” Wootten’s 9th Australian Division had landed and was advancing along the beach. To the west, Major General “Bloody George” Vasey’s 7th Australian Division had been flown into Nadzab, after the capture of the airfield by US paratroops and Australian gunners, and was driving the Japanese down the Markham River valley toward Lae and the sea. One of Vasey’s lead battalions were Lieutenant Colonel R. H. Marson’s Queenslanders of the 2/25th. By 10 am on 13 September the battalion had been fighting through heavy jungle over the ridges beside the Markham Valley for four days and Japanese resistance was getting stronger. As they picked their way down the hill toward the overgrown Heath’s Plantation, the Japanese were close, contacts frequent, and casualties growing. Captain G. A. T. Gow’s B Company, in the lead, was suddenly confronted by entrenched enemy positions. The two forward platoons went to ground and were pinned down by intense enemy rifle and machine-gun fire. With the battle rapidly intensifying, Lieutenant R. T. C. Burns’s platoon from B Company, found that it had five of its men dead and three wounded. The rest made themselves as flat as they could behind the dense but flimsy cover and returned the withering fire. Section commander Corporal W. H. “Billy” Richards was one of those wounded. He had multiple wounds in the arm, back, and stomach, and lay forward of the Australian positions, bleeding profusely. Despite his pain and exposed position, he shouted instructions to his men, directing their fire on the Japanese he could see. With scant cover from a tree stump, Richards would not last long. Uphill from Richards’s stump, Privates J. H. Bickle and Richard Kelliher sheltered in a shallow dip. With the comment, “I’d better go and bring him in”, Kelliher took Bickle’s last hand grenade and charged down the hill at the machine-gun position that was their greatest threat. His grenades did not kill all of the crew, so he returned to his platoon mates, borrowed a Bren gun, and renewed his attack. After a return trip under fire to get another magazine, Kelliher knocked out the machine-gun position; then, still under enemy fire, he carried Richards to safety. Richard Kelliher was born on 1 September 1910 at Ballybranagh, Tralee, County Kerry, Ireland. While still in his teens, he migrated to Queensland with his sister Norah. They left five other brothers and a sister with their mother and ailing father in County Kerry. The Great Depression hit shortly after the brother and sister arrived in Australia. Initially inseparable, they were forced them to follow different paths by the hard times they encountered. Norah married and moved to Sydney. Richard left Brisbane, where he had served as a sacristan at St Stephen’s Cathedral, and tramped the outback, finding work as a farmhand, cane cutter, house painter, and share farmer. The hard times and harsh conditions took their toll. Kelliher contracted typhoid and meningitis. For Kelliher, as for many Australians, the war came as welcome relief from the Depression. 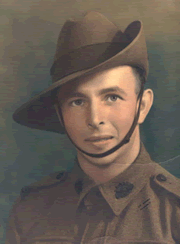 >Kelliher enlisted in the Second AIF on 21 February 1941. He was posted to 2/25th Battalion as a reinforcement for the men they had lost in the Syrian campaign. He arrived in the Middle East too late to take part in the fighting against the Vichy French. The 7th Division returned to Australia in 1942, and was rushed to Papua to help stop the Japanese advancing down the Kokoda Trail toward Port Moresby. The battalion went into action in the second week of September 1942 and by November had helped drive the Japanese back across the Owen Stanley Range to Gona. In just over three months of fighting, the 2/25th suffered almost 60 per cent casualties. It was during one of the costly attacks on the Japanese beachhead base that Private Kelliher left his section as it advanced to attack the enemy. A rumour circulated that he had run away. He claimed that he had been sent back for information, but his platoon commander was killed and so could not be called in his defence. Kelliher fell ill with a bout of malaria and was repatriated to Australia. He rejoined the battalion in Queensland , and it was then that accusations surfaced about his earlier conduct: he was accused of “failing to get into his allotted position with his section and allegedly saying, ‘its too bloody hot for me I am not a bloody fool’”. Kelliher suffered a District Court Martial. He was charged with misbehaving before the enemy in such a manner as to show cowardice. The evidence against him was based on hearsay, and the finding against him was quashed a few months later. After Lae, Kelliher’s health broke down again. He spent months in hospital and rejoined the battalion in time to return with it to Australia. In hospital in New Guinea, he learned that he had been awarded the VC. In 1944 he was medically downgraded, no longer regarded as fit enough to serve in the infantry. He finished the war serving in a workshop. After the war Kelliher found himself little better off than he had been during the Depression. His medal earned him three trips to the United Kingdom. Kelliher’s first visit was in 1946 with the Australian Victory Contingent to parade through London; the second was to attend the coronation of Queen Elizabeth II, in 1953; and his last, in 1956, was to participate in the celebrations to mark the centenary of the award. Despite his fame a reasonable pay packet remained elusive. Kelliher tried but failed to obtain a taxi driver’s licence while working as a cleaner at City Hall, Brisbane. In 1949 he married 19-year old Olive Margaret Hearn. The family moved to Melbourne, and Richard eventually found work as a gardener. Over the next six years Richard and Olive had three children. In 1965 Olive Kelliher remarried. With her children at school and bills to pay she offered her late husband’s medals for sale. There was a public outcry, and they were withdrawn. Veterans of Kelliher’s old battalion, the 2/25th, raised money and purchased the medals. On 13 September 1966, 13 years to the day after he earned them, Private Richard Kelliher’s Victoria Cross and service medals were presented to the Australian War Memorial by the 2/25th Battalion Association. They have been on display in the Memorial’s Hall of Valour ever since. E. G. Keogh, South West Pacific 1941-45 (Melbourne: Grayflower Productions, 1965)"
Corporal William Henry Richards M.M. Page Authority 12/100 - Moz Ranking 2.76 /10 - Domain Authority 20/100 - 3 Links on 23/01/2014. Page re-published 13/10/2013.